WW1 planes developed very fast! From pusher biplanes in 1914 to the first monoplanes. Here are 5 books that will expand your library. WW1 planes are fascinating to many and can make into stable and well flying RC airplanes. Many have really short noses, in order to balance with the weight of a rotary engine. So every effort must be made in a model to keep the tail as light as possible. Even then don't be surprised if a lot of weight needs to be added to the nose. Better to be over weight than tail heavey! The books listed here are all available from Amazon and will be interesting to the modeler and the full size aircraft entheusiaste. WW1 planes had many unusual characteristics and I have listed a couple of them below. At the beginning of the war (1914) parachutes were looked upon as a circus trick and were not considered a safe means of survival.. The British were not allowed to use parachutes! The thinking was that pilots would bail out at the first sign of trouble! So it is easy to understand that the greatest fear was of fire on board. The only option if fire broke out was to dive and try and extinguish the flames or to land and run away as fast as possible! The German "Powers that be" had no such crazy ideas and by the end of the war(1918), as parachute development progressed, each pilot was issued this life saver. It is worth mentioning that Herman Goering was saved by a parachute. This unusual design of engine was used by all the powers. The crankshaft was stationary and the crankcase and cylinders rotated with the propeller. This design was very efficient from a power to weight ratio standpoint and the spinning cylinders were easily air cooled. Vibration was low as there were few moving parts and the cylinders acted as a flywheel. However there were a few drawbacks! RPM was limited and by the end of the war 2000 RPM was possible but this was the practical limit. This restricted further development and the inline, multi cylinder engine became the "norm". There was no carburetor and speed control was by "blipping" the magneto, Lubrication was by using castor oil and a plentiful supply streamed back into the pilots face! Not a pleasant experience!! Due to the engine being a heavy spinning flywheel, gyroscopic precession seriously effected turns. Left turns required a lot of stick effort and gave a nose up tendency whilst right turns were almost instantaneous and gave a severe nose down effect. All in all you have to take your hat off, to all the pilots of WW1 planes! 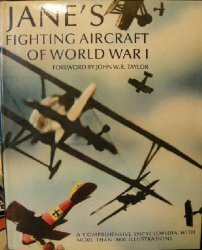 This is the first selection and we must admit that it is not a book and features all types of airplanes but does include a fair number of WW1 types. 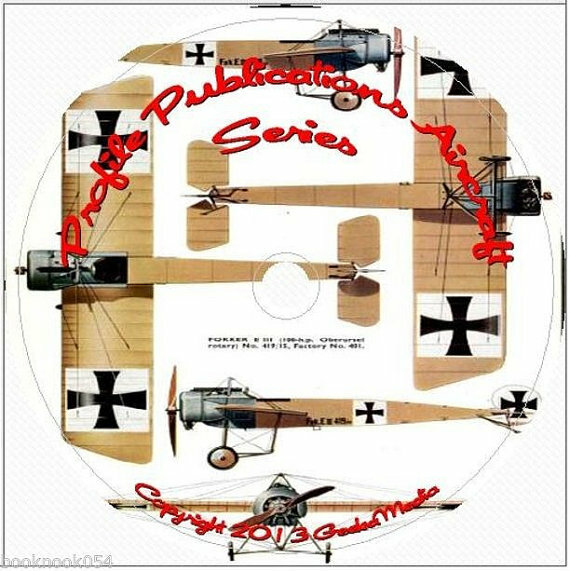 This CD is included because it has the full collection of the "Aircraft in profile" series. I have a few of the bound volumes but am delighted that now I have the full collection available to me. The price is very reasonable and my copy arrived in a few days after purchasing on Amazon. All 262 volumes are there in PDF format. Some of the scans are a bit off but still readable. One thing that I found annoying was that within a few of the volumes, a different zoom scale was used on some of the pages. This means that you need to adjust the zoom value backwards and forwards. Despite these minor criticisms I wholeheartedly recommend this CD as great value for the money! Unfortunately this CD is no longer available-glad I bought a copy a few months ago! 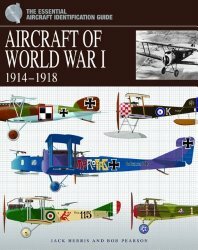 This book contains more than 200 color profiles of the more popular WW1 planes as well as a few of the more obscure. I found 18 total Amazon reviews, the majority of which were 5 star. Please not that there are no line drawings of the subjects but the color profiles will be useful to the modeler looking for paint schemes. For further information, click here or on the image or title. This is a reprint of the original 1919 edition. It is THE reference for ALL of the WW1 planes. Every one built is listed under the country of manufacture. There are over 1000 illustrations in the 320 pages. For more details click the image or the title. By clicking you will visit the Amazon page where more details and reviews are available. This 64 page, quality soft cover book gives a precise and accurate account of one of the most successful German WW1 planes. Many photos and color illustrations compliment the easy to read text. The D.III was one of the first airplanes to employ twin machine guns and quickly gave Germany air superiority after a period when the British and French dominated the skies. The 3 manufacturers are discussed and differences in appearance and performance noted. For more information CLICK HERE or on the image or heading. 1918 and the WW1 was almost over. 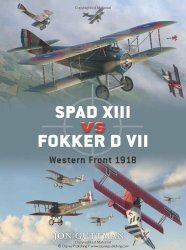 The French and Americans were flying the Spad XIII and the Germans relied upon the Fokker D VII. These aircraft represented the ultimate WW1 plane. Rugged, fast and maneuverable and equipped with 2 machine guns they were often dog fighting with each other. This 80 page paperback compares the 2 fighters and explains the features that made them competitive. For more details and Amazon reviews, CLICK HERE or on the image or heading.